One of the common ideas about God is that God is like a sleepy old man. Not really doing much (at least not what you’ve suggested be done). Not really happy (rolling those divine eyes at how dumb people are). Not a people-oriented being but a loner. Let me suggest otherwise. First, God’s joy isn’t like the crabby person who says, “I have joy buried deep in my heart.” So deep you never see it cross their face. God delights in people (Zeph 3:17); God made sea animals that play (Ps 104:26); God’s joy is so contagious that people can live off the strength of it (Neh 8:10). God’s joy (happiness, if you will) isn’t like ours, which often comes from receiving gifts or love from others. God is happy within God’s own self. God invites us to be “in Christ” (over 90 times in the New Testament), causing us to have joy even when things look bad. Secondly, God is energetic. Think of the energy required to create the world, to create a humming bird whose wings move so fast you can’t see them move, to create a respiratory system that causes you to breathe nonstop and fight off infection at the same time. A frequent picture of God is as fire, hot energy itself (Heb 12:29; Matt 3:11; Exod 14:19-25). Think of how we refer to someone as a fireball. I often refer to my granddaughter as a volcano because of her endless energy. God’s energy moves stealthily on our behalf that we often don’t notice yet. Today, God invites us into a dynamic partnership in loving the people around us. Together this Trinity created humans (Gen 1:26). Today God is one who loves to hang out with you, guide you, let you know you are never alone. The more we let our mind marinate in these ideas, the more likely we are to catch the joy, energy and highly-relational ways of God. 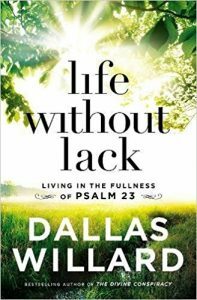 *LWL stands for the upcoming book Life without Lack to be released Feb 27th. It’s “by” Dallas Willard because it’s taken from my favorite set of tapes recorded in the 70s. The book sounds just like him and is his most accessible book yet. So if you’ve found his other books to be tough-sledding, try this one!